Every 20 minutes, someone is diagnosed with blood cancer. But doctor's know the cure: and it could be you. Earlier this year I signed up with Anthony Nolan's stem cell register, and will now stay on it until I turn 60. They sent me out a spit kit in the post and I gave them a quick saliva sample. Now, whenever a patient with blood cancer or a blood disorder needs a lifesaving stem cell transplant, they can search the register and if I'm a match, they’ll be in touch to let me know I could potentially save someone's life. A lot of people have told me they haven't registered as they're worried about the procedure, however 9 out of 10 people donate their stem cells in a quick and easy process similar to giving blood. A nurse visits you at your home or office to give you injections over four days to increase the number of stem cells your body produces. You then travel to a collection center where a nurse or doctor inserts a tiny tube in your arm to draw out the blood, and it then passes through a machine to collect the stem cells. Yep, it’s that simple! Donating only takes about 4-5 hours. Occasionally they’ll need to collect more cells the following day, but you can go home inbetween. You might experience side effects like flu-like symptoms and aching, but they’re usually mild and only last just a couple of days. Easier than you thought, eh? 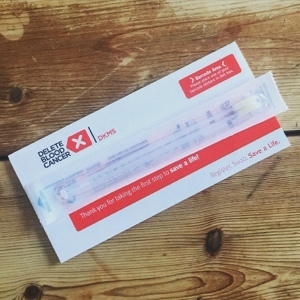 1 in 10 donors will have their stem cells collected via the bone marrow itself, while under general anaesthetic. You’ll spend two nights in a London hospital and doctors will take some bone marrow from your pelvis using a needle and syringe. You’ll probably feel tired and have a little bruising and pain in your lower back after donation, but this generally passes within a week or so. The procedure might seem a little scary, but in my opinion it's worth it to know you've potentially saved a life. After donation a courier will collect your cells and deliver them to the hospital where the recipient is waiting. They’ll usually give your stem cells to the recipient the same day or the day after you donate. If the recipient’s body accepts them, the stem cells will start making healthy blood cells. You’ve given that person the chance to live – all while you were lying in bed. Not bad, eh? If you're interested in joining the regiester you can sign up here.